Interested in knowing about what Chatbots are? Read through this blog to get some information about this new application. Chatbots is the latest buzz these days. You can see them in Facebook Messenger, Whats App and Skype. They are exactly how they make sound: a chat with a bot. This kind of artificial intelligence or AI is used where users have to interact with a virtual agent with natural language messaging. Do you know why are they becoming so popular? Chatbots scale businesses to build good relation with their customers. This helps businesses to save money and as such, many businesses now are using this technology. Available 24*7 – Experts working in android application development company in India have found that Chatbots work 24*7 which means 7 days in a week and 365 days in a year. They are now replacing the live chats and other contact options such as phone calls and emails. As these are virtually robots, they follow your instructions all the time and do not get tired. This improves the level of satisfaction of customers and helps you acquire a secured position in your specific sector. 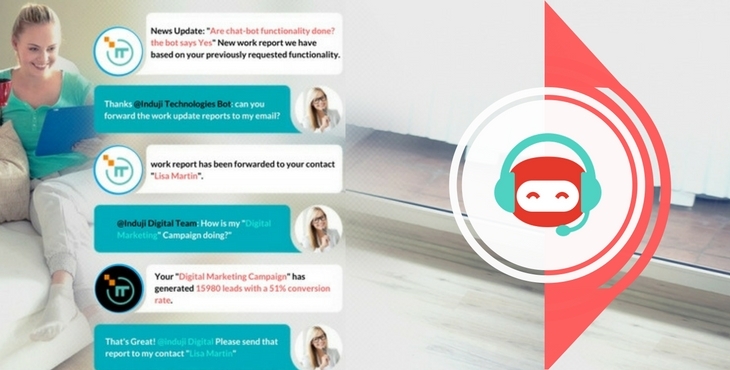 Manage clients easily – Chatbots allow you to start conversations with several people at a time. Every person will answer you instantly whatever might be the timing of the day and the number of people you want to connect together. This allows you to deal with more customers at the same time which is beneficial for your business. Thus, Chatbots solutions help your business to scale up the operations into the new market without worrying about handling several incoming calls altogether. Save your money – Chatbots are the one time investment that allows businesses to lessen the costs on staffs. You may incorporate the service of customer support chatbots for answering the queries of your customers and pass on the complex ones to the customer care representatives. Popularize your brand – Online marketers recommend businesses to engage customers with your brand. This is because the more customers get engaged to your brand, the more you can earn from your business. Though social media sites have different marketing options for prospective clients, Chatbots can spice up everything by making it more engaging. Inform customers about your products – According to experts of android application development companies, Chatbots help by letting probable clients know about your products and services in a conversational manner. If you are setting up your new business, it might be confusing for your probable clients. Chatbots explain it to them in each step and answer any queries that they might have. Great satisfaction to customers – Chatbots treat customers in the most polite way despite how rude the person may be. This gives great satisfaction in the minds of customers who use this app for their need. Businesses can make good profit with it as more customers get to know about your products and services and they might be interested in using them. Thus, Chatbots help businesses of all sizes to improve customer experience, boost sales and build better relationships with clients.